The Heartbreakers Girls Softball Association, a non-profit organization, was founded in 1993. The goal for our organization is to play at the highest level of fastpitch softball. Over 100 girls have gone on to compete at the collegiate level including 4 NCAA Division 1 Conference Player of the year winners. For the 2017 season, there are 9 teams in the 23 and under through 10 and under age groups. These teams compete in tournament play in the Central Atlantic region with the goal of qualifying for National tournaments held throughtout the country. Coach Terry Burdete, a well respected and highly-successful travel coach. 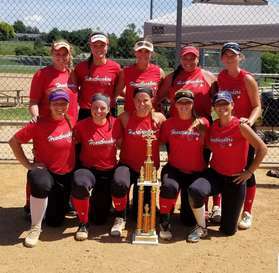 As a head coach of the 18u Heartbreakers team, Burdette has won over 800 games since 1995. He was recognized at the 2010 National Fastpitch Coaches Association (NFCA) Convention for eclipsing the 600-win plateau. His Heartbreaker squads have amassed 7 top 10 finishes in Amateur Softball Association (ASA) and Protect Our Nation's Youth (PONY) Nationals, which included 4 top 3 finished. Also finished 13th place at 2016 ASA/USA Gold Nationals in Oklahoma City, Ok. Burdette's coaching career earned him induction into the Greater Washington Fastpitch Softball Hall of Fame in 2013 and the Alvin G. Quinn Frederick County Hall of Fame in 2016. Our Heartbreakers 23 team will be playing in 4 or 5 tournaments in June & July, 2019. One of the tournaments will be the Maryland State Championship tournament. This team will be made up of Former Heartbreakers & College players. This team will give our girls the opportunity to stay sharp during their summer break. This was our 1st year of playing in 4 adult tournaments. Our girls did GREAT! We finished 15-6-1 with one tournament Championship (12th Anunnal Carol Sparro Memorial) & Maryland State Championship Finalist! 2018 We finished 10-4-1 with a runner up at 13th Annual Carol Sparre Memorial & winning Maryland State Championship! We need your continued support for the 2019 season. All donations are fully tax deductible and will help us to defer the tremendous expense it takes to maintain a National Championship contender. Thank you for your interest and support of the Heartbreakers 23u team. If you have any question, please contact me at the below information.